With so many Americans facing health problems and chronic pain, we have a population that is increasingly medicated and struggling with wellness. We spend billions of dollars a year on medications with side effects often worse than our ailments, and read conflicting advice daily about the best diets and exercise plans. With so much confusion and dissatisfaction, many people are looking for alternatives, or simply just new ideas to add to their existing wellness regimens. For example, many people who are focused on improved physical fitness, better posture, or stress relief turn to the practice of Rolfing™ for an increased sense of wellbeing. While Rolfing doesn’t take the place of any medical treatments, it can help with a variety of physical issues. How Can Rolfing Help Me? Rolfing practitioners help bring your body back into alignment through a series of deep tissue bodywork, that addresses strain patterns in your connective tissue. A certified Rolfer uses targeted methods to release thickened connective tissue, which can restore vitality to your fascial system. This helps alleviate chronic pain, restore posture, promote ease of movement, prevent injury, and regain a sense of vitality and wellbeing. Rolfing is a practice employed by people of all walks of life because it promotes a holistic approach to personal wellness. 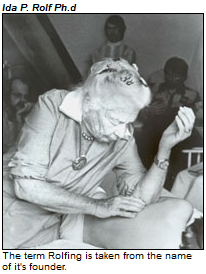 How Do I Find a Rolfing Practitioner? When searching for a Rolf movement instructor, you want to look for someone who has the proper training and certifications to perform safely and effectively. In the greater Los Angeles area, Bob Alonzi is a Certified Advanced Rolfer® with over 25 years in the industry. He received his training and certifications directly from the Rolf Institute, and remains committed to staying on the forefront of industry best practices. He believes that Rolfing can contribute to your overall health and wellbeing, and he invites you to contact his practice for more information. If you want help taking control of your health, Rolfing may just be the missing piece on your journey to wellness.